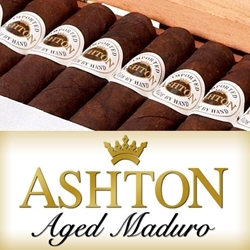 Ashton Aged Maduro is a dark sweet hand-rolled premium cigar infused with perfectly-aged blended tobacco fillers and binders from the Dominican, bundled up perfectly in a dark, oily, slowly fermented Maduro Connecticut Broadleaf wrapper. Every Ashton Aged Maduro is hand rolled individually at the Château de la Fuente in the Dominican Republic. If you love a high quality premium maduro cigar, chose any of the styles listed below at our online cigars store and you will have a full-bodied smoking experience that is perfectly consistent and flavorful each time you light one up. Ashton Aged Maduro are hand rolled premium cigars that make an excellent choice for any cigar connoisseur. Smokers Discounts has made it easy and affordable to buy premium cigars online. A variety of sizes and flavors are listed below at our discount online cigar store. Each of these styles are in stock and available. Call us for more details!